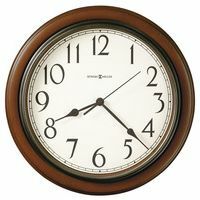 Please carefully read the description of each individual clock, and the chime(s) listed, to make sure they match, and that the clock that you are evaluating has the same chime(s). ALSO, please note that while these chimes were actually recorded from a clock in our own NYC Grand Central Station Store, the sound of the chimes on any individual clock may vary somewhat due to manufacturer, movement, case, and other variables. The purpose of sharing these chimes here is to give you as much of an in-Store shopping experience as possible. * Estimate. Actual rates and payments available when you check out. 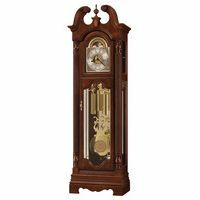 Traditional tambour styling features decorative top molding and triangular elm burl overlays. The off-white dial offers black Arabic numerals with serpentine hands. Convex glass crystal is framed by a hinged, solid brass bezel. 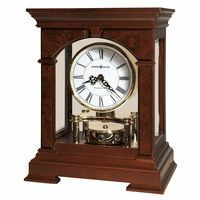 A high-precision, German-made, Kieninger® key-wound, Westminster chime movement plays 1/4, 1/2, and 3/4 chimes accordingly with full chime and strike on the hour. An industry exclusive duel-ratchet winding arbor ensures safe movement winding. Chime silence option and durable bronze bushings.